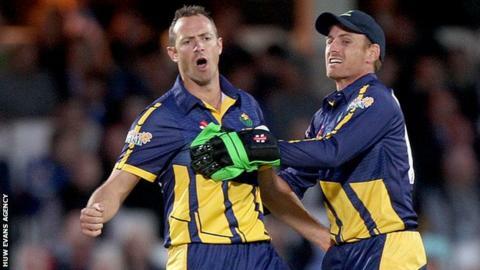 Glamorgan captain Jacques Rudolph hopes veteran spinner Dean Cosker will be back in the Championship side soon. Cosker was left out for the first time in two years in the Division Two match against Essex in Cardiff, where Glamorgan reached 187-5 on day one. Off-spinner Andrew Salter was preferred to Cosker, who took only six wickets in the first four Championship games. "I feel sorry for him because he played really well in Kent with the bat," Rudolph told BBC Wales. "He then bowled incredibly well with the white ball on Friday night [in the T20 win at Surrey], but we'll have him back for the T20 this Friday" Rudolph told BBC Wales. Left-armer Cosker's omission came after a career-best first-class innings of 69 at Canterbury and a four-wicket haul in the T20 Blast win over Surrey. "We just felt Salts [Salter] has been bowling really well for the second team," said Rudolph, who led the way with a battling 81 not out against Essex on the rain-shortened opening day. "Dean bowled really well for us on Friday with the white ball but he potentially lacks a bit of confidence with the red ball. "I said to him it shouldn't be seen as a complete drop, he's a good player and he'll be back soon enough." But it was a good day for another long-serving Glamorgan player, Mark Wallace, who became the first specialist wicket-keeper to pass 10,000 first-class runs for the county, described as a "great achievement" by Rudolph. Meanwhile, Rudolph is hoping he can help steer his team to a respectable total on day two against Essex if the forecast poor weather holds off. "We've got to make the most of it. It would have been ideal with one less wicket down but some of the guys really got good balls, it's not like they threw their wickets away," Rudolph added. "It was tough out there so if we can scrape another 100 to 140 runs it should put us in a good position." The Glamorgan captain already has one century to his name this season, in the opening match against Leicestershire.